Labour Market Integration of Refugees: What Works? Integrating the more than one million refugees who have come to Europe since 2015 is a key challenge for the present social peace and the future economic prosperity of the continent. Rapid labour market integration is crucial in making that integration succeed and in turning the refugee crisis into an economic boost for Europe. However, the OECD has estimated that it takes 20 years for refugees to achieve the same employment rates as native workers. Now, what are EU Member States doing to facilitate that process and shorten the labour market assimilation process for recent refugees? The presentation will review the main findings of a recent study carried out by the Migration Policy Centre of the European University Institute with the support of the Bertelsmann Stiftung. 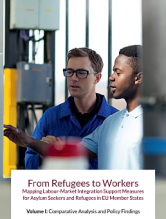 The study, ‘From Refugees to Workers: Mapping Labour Market Integration Support Measures for Refugees and Asylum-Seekers in EU Member States’, is based on nine country case studies (including Austria, carried out by wiiw). It reviews 94 concrete support measures for skills assessment and skills development, economic incentives for integration, job intermediation, recognition of skills and qualifications and ‘integration packages’. It researches how these measures work and the challenges that they face, and what can be learnt from the experience so far. According to the conclusions of the study, despite different social, institutional and labour market contexts across Europe, there is a high degree of comparability, both in terms of the structural challenges faced and in terms of policy responses to them. Some recurrent challenges to the labour market integration of refugees throughout the European Union include: the legal and administrative hurdles making their integration more difficult; the lack of capacity in public employment services and other state institutions for tackling the specific needs of this group; and insufficient coordination among local and national governments, leading to some fragmentation in implemented measures.